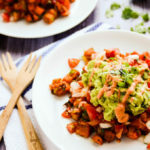 This vegan southwest sweet potato breakfast hash is brimming with feel-good ingredients and satisfying flavors. Sweet potatoes, yellow onion, and garlic are cooked to slightly-caramelized perfection along with smoked paprika, cumin, and turmeric. A handful of fresh cilantro is folded in to add brightness and balance, but it's the toppings on this dish that take it from good to downright delicious. Fresh pico de gallo, poblano-spiced guacamole, and a chipotle cream are layered on top of the hash to create a mountain of plant-powered goodness. Heat the coconut oil in a large skillet over medium heat. Add in the garlic, yellow onion, sweet potatoes, paprika, cumin, turmeric, and sea salt. Let the mixture cook for 20-25 minutes, stirring just every few minutes so that the potatoes have a chance to develop a slight caramelization. Once the sweet potatoes are tender, turn off the heat and stir in the fresh cilantro. As the sweet potato hash cooks, scoop the flesh of one avocado into a bowl and mash it with a fork. Stir in the juice of 1/2 to one lime (or to taste), the diced poblano pepper, and sea salt, to taste. Add the tomatoes, white onion, cilantro, and sea salt to a small bowl and stir. Add the coconut cream, chipotle peppers, water, and sea salt to a blender. Blend on high for 1-2 minutes or until the mixture is almost completely smooth. Scoop the sweet potato hash onto plates and top with the pico de gallo, guacamole, and a drizzle of the chipotle cream.